Go behind the scenes at the Houston Symphony! 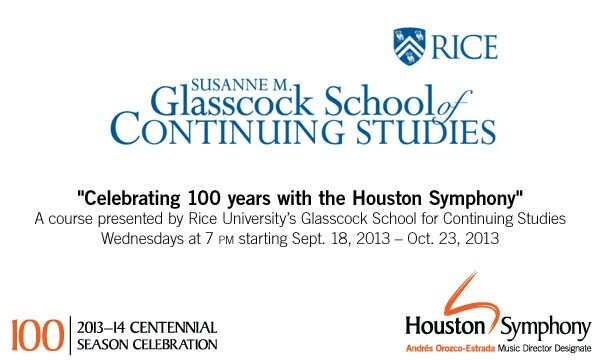 In recognition of the Symphony’s Centennial Season, Rice University’s Glasscock School for Continuing Studies will offer a six session class on the cornerstone of Houston’s performing arts scene. Join several musicians from the Symphony and a panel of guest speakers as they explore different topics of the Symphony’s Centennial. Topics include: the search process for the Symphony’s incoming Music Director, Andrés Orozco-Estrada, important moments in the Symphony’s 100 year history and the upcoming presentation of Mahler’s Symphony of a Thousand. The course will be hosted by Symphony Archivist, Ginny Garrett, and will include access to a Jones Hall dress rehearsal, backstage tour and two pairs of concert tickets for performances in the Centennial Season. This entry was posted in Announcements on September 17, 2013 by Rebecca.